As shipments of Apple's latest and greatest Apple TV reach eager customers, some may be disappointed to find Apple's Remote app for iOS and watchOS incompatible with the new model, meaning all tvOS navigation and text entry must be conducted via the included Siri Remote and onscreen keyboard. Apple itself confirms the Remote apps for iPhone and Apple Watch only support third-generation Apple TVs or earlier, as noted by a recently updated support document covering app setup. Seen above, the webpage now says in no uncertain terms that Remote cannot be used with the new Apple TV. It is unclear if Apple chose to leave out Remote app compatibility in a bid to push the new Siri-powered control interface, but the decision is already causing problems for users averse to onscreen keyboards. Some reviewers found the new Apple TV version more difficult to use than past iterations due to an odd character layout, for example. Paring down buttons on a physical remote meant Apple had to implement hunt-and-peck style alphanumeric entry, which on previous generation Apple TV units is arranged in an alphabetized 6-by-6 digit square with extra rows for numbers, special characters and commands. 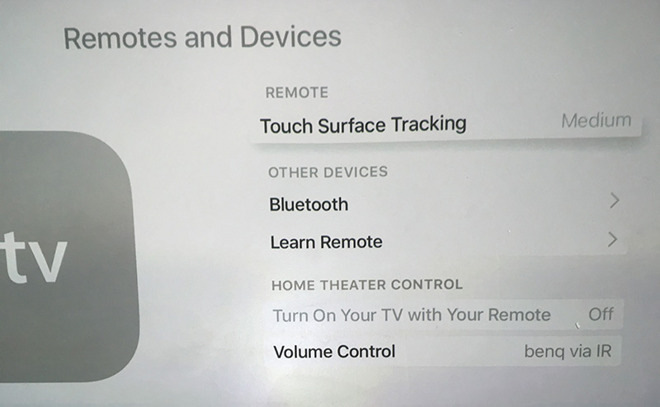 On the new Apple TV that square is stretched to a long row of letters, another for numbers and yet another for text input options, meaning users have to swipe back and forth using Siri Remote's touchpad. Remote control setup menu screen on 4th-gen Apple TV. For many, the Remote app was an effective workaround that provided a handy soft keyboard on an iPhone or iPad, though others preferred Bluetooth keyboards (the 4th-gen Apple TV nixes this feature as well for certain models). Further, Apple Watch owners were able to quickly access controls for UI navigation and content playback via the native Remote app. It is unknown whether or not Apple has plans to tack on compatibility, but disassociating Apple TV from its flagship mobile products seems like a glaring oversight. It is possible that future Remote app updates will bring back support for both iOS and native watchOS apps, though a tvOS update might also be required.